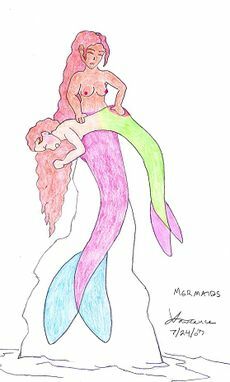 A spanking picture with mermaids, a fantasy creature. By Lawrence Kinden. a genre of writing or film that uses magic, mythological or other supernatural elements as an element of the plot, theme, or setting. Fantasy stories are fiction and usually feature non-human races. They can be set on Earth, in the present, past, or the future, or in another world. Some mainstream fantasy fiction includes spanking scenes: see Spanking in Fantasy for a discussion of these. Some authors of spanking stories use fantasy settings or devices, see Spanking fantasy fiction for a discussion of these. This page was last edited on 30 December 2015, at 16:59.